This idea originated with a friend’s Facebook post on peppermint pancakes. 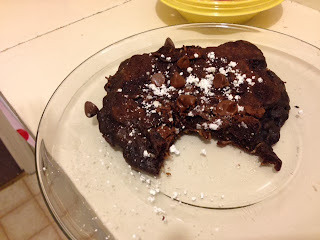 He added peppermint chocolate chips to a regular pancake batter. 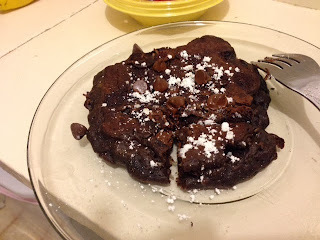 My initial plan was to make chocolate peppermint pancakes, but at the grocery store I was drawn to the coconut extract over the peppermint extract. I just love coconut. To heighten the coconut flavor, I used sweetened coconut flakes and coconut milk in addition to the coconut extract. 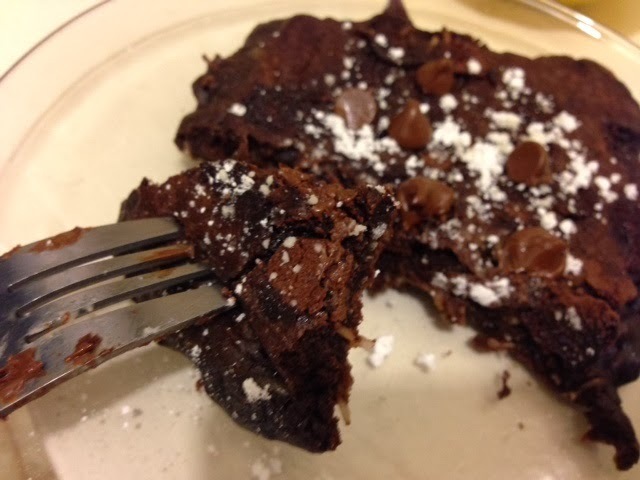 I’ll make chocolate peppermint pancakes another day. The original recipe was for chocolate pancakes, a beautiful thing in and of itself. Adding coconut makes them a little more like German chocolate cake, which is an ever more beautiful thing to behold. The ingredients are ½ cup sweetened coconut flakes, 1 cup coconut milk, 1 egg, 2 tablespoons butter, 1 cup flour, 1/3 cup cocoa powder, ¼ cup sugar, ½ teaspoon baking soda, ½ teaspoon salt, 1 cup chocolate chips, and 1 ½ teaspoons coconut extract. In large bowl I stirred together the coconut flakes, cocoa powder, sugar, baking soda, flour, and salt. This took a little effort because my cocoa powder was a little clumpy. I probably could have shifted the cocoa powder beforehand. I combined to coconut milk, melted butter, egg, and coconut extract. I beat this together with a fork. I poured the liquid ingredients into the dry mixture and stirred until the batter was just combined. I don't have a picture as evidence, but I added the chocolate chips as well. The batter was pretty thick. It made delightful little pancakes, but I could have added an additional tablespoon or two of coconut milk. I poured a third of a cup of the batter onto a buttered frying pan and cooked it until set. I then flipped and cooked the other side for an additional minute or two. I ate these pancakes with powdered sugar and additional chocolate chips sprinkled on top. Lovely! Who doesn’t love dessert for breakfast? These are chocolaty but not overwhelmingly sweet, which is ideal for a breakfast food. The coconut flavor is present but not overwhelming. I've never made chocolate pancakes, but I've seen recipes on Pinterest, and this one sounds so appetizing, especially with coconut! YUM! Yum - pancakes just got even better, Laura! My hubby would go nuts for these! He loves German chocolate- and pancakes ;) I really like how you used so many layers of coconut flavor. Great recipe! Thanks! The coconut is a great addition!